Riverside Fitness Centre and Riverside Vacation Rentals! Robert and Liana Beaudry co-own and operate Riverside Fitness Centre in the town of Clearwater, B.C. Originally from Quebec City, Robert has been actively involved within the adventure tourism/guiding industry in Western Canada for over 25 years. 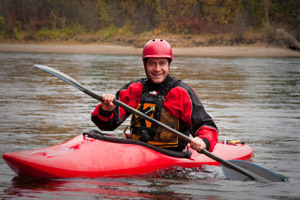 Robert was a Member of the Canadian White Water Kayaking Team. He has taught numerous guide training courses at the Thompson Rivers University in Kamloops and is involved with the Provincial Emergency Program of B.C. as a Search Manager and River Rescue Specialist. Over the years, Robert has commercially river guided in Quebec, Alberta, British Columbia, the Yukon and the N.W.T. It has provided him with the opportunity to raft guide and teach the sport of whitewater kayaking to clients from every corner of the globe. Liana is a fully certified BCRPA weight trainers and Yoga instructor at the Fitness Centre. She is proud to provide a top notch enthusiastic service to our gym members and newcomers on a year round basis. Liana is also a massage practitioner and offers deep healing relaxation massages out of her Yoga Studio. During the summer rafting months, Liana focuses her energy into offering top quality client care from the front desk reservation, to coordinating personal equipment set up to fulfilling shuttle bus driver duties. Born and raised in Jasper National Park, she is very familiar with the international tourism trade and service industry. The BCRPA is a provincial, not-for-profit professional association that has provided educational opportunities, information and advocacy for over 40 years. Through its Fitness Leadership Registration program, the BCRPA acts as a regulatory body by collaboratively developing, recognizing and promoting provincial standards for the training and registration of fitness leaders in BC. The program has a current registration of nearly 3,000 leaders and has gained recognition as the standard against which the qualifications of a fitness leader may be measured in BC. Pacific Sport Interior BC - PacificSport Interior BC provides programs and services for athletes and coaches at all levels of sport performance. Riverside Fitness Centre's extensive services are available to high performance athletes who have made the Interior their home. The Kamloops-based center has 11 partner sports: Alpine Skiing, Athletics, Basketball, Gymnastics, Rowing, Snowboarding, Swimming, Synchronized Swimming, Tennis, Volleyball, and Wrestling. The motto for PacificSport Interior BC is "Keeping Our Heroes at Home". We strive to provide opportunities for athletes to train under high performance coaches while accessing services to support their development at home. The combination of world-class training facilities, certified coaching along with the opportunities related to Canada’s hosting of the 2010 Olympic and Paralympic Winter Games, we are well positioned to provide great support in BC’s Interior region and Riverside Fitness Centre is proud to be an active supporter of the program.